Hello there how is your week going? I few weeks ago I was approached by Emily at www.vouchercodes.com and she asked if I was willing to create a Valentine inspired tutorial for the Most wanted *LOVE IS ALL YOU NEED* DIY Challenge? I accepted and I knew exactly what I wanted to do. You to can enter the deadline is 11February 2011 and you can read more about the challenge HERE. Now then men cards are tricky at the best of time but Valentine is one occasion when you can allow yourself to be as mushy as you like, still if you can't bear mushy how about something that's fun for the man in your life? I am pretty sure every wife, girlfriend long time partner out there had made a joke about kissing a frog at some point. Here it is my hopeful and very lovely answer to Mr.Kermit. You just wouldn't resist, would you? Basic Gray, Old Olive, Pear Pizzaz and Real Red are my colours and a full list of the products used is given in my video. I hope he brought a smile to your face and I hope it inspired you to make one for your lovely Prince. Coooooooooool, I love the 'love' background. Monica, thank you for sharing this with us I will certainly have a play as I love punch art. Aww Monica this is so cute, love the fab frog you've created especially the googly eyes. You are so talented. How cute is this!! Thanks so much for taking the time to video the steps to making the frog! Love the card! Thanks for the inspiration! Kermit is adorable. I love your blog header too! Froggy is just way to COOL! I just love him! What a wonderful talent you have. Thanks for sharing. Monica, I absolutely adore your card! Loved all the special elements you put into it....the torn paper, the love-stamped background, and the tiny crown and bow tie Mr. Froggie is wearing! I also love your accent in your video....you did a terrific job, by the way! Monica thank you sooooooo much for such wonderful inspiration! I sat and watched your video and made the card at the same time (changing a few things I didn't have) and I LOVE IT! So cute! and not too mushy for my DH. Fab funky frog, Monica! I still haven't decided what I'm making for the challenge... IF I even get time - you know how SAB is! 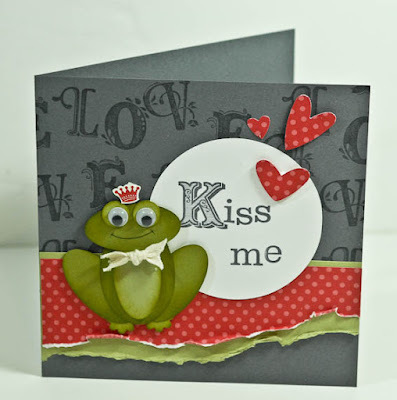 Really cute project Monica - just loving that little frog! Thanks Monica. Myself and the ladies at craft club really enjoyed making this froggy card.